This is definitely an unusual topic for a war-games campaign, but play testing the DBA 3.0 draft set, the reader will encounter several new terrain options. The BUA now offers four different possibilities; City, Fort, Hamlet and Edifice and the most common geography for this campaign, Arable now adds ploughland with improved definitions of fields or enclosures. 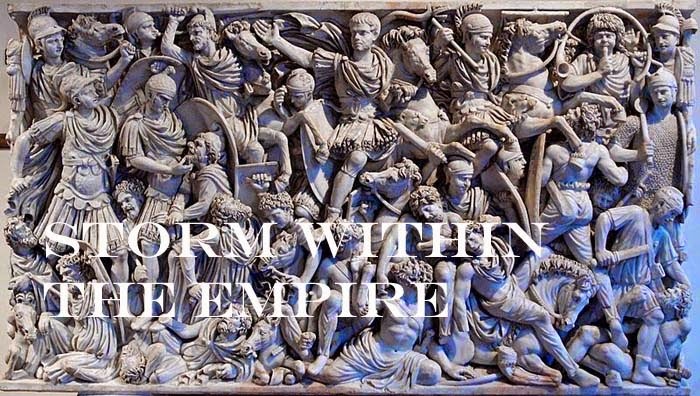 For the campaign, Storm within the Empire, the seasonal movement phases are now expanded to reflect the months of March to November; essentially having the player become introduced to medieval farming cycles. 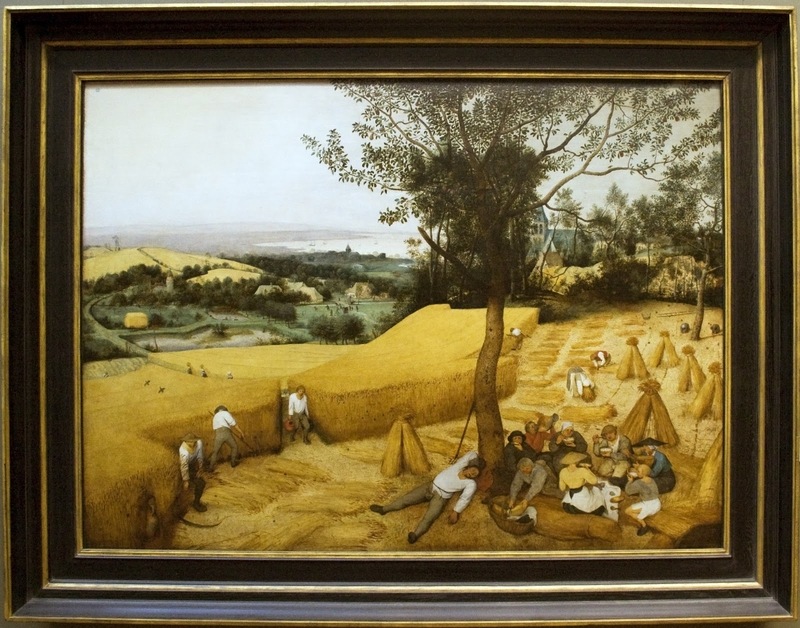 From Wikipedia, Crop Rotation three year rotation was common practice during the middle ages. Rye or Winter wheat, followed by Spring oats or barley, then for a period of time, the land would lie fallow. Crops such as peas, beans, lentils and turnips could also replace oats or barley in Springtime. As miniature painters we do pay attention to a minutia of detail from buttons, lace, trim, correct belting, shape of quiver and colour combinations. I rather tire from the baize green field we use for a table surface and opted for a mottled earth surface sprinkled with grass, but leaving some areas exposed or thinly covered. Placemats (vinyl) are an ideal thickness and will take acrylic paint. After cutting to proper size, painted earth I can add electrostatic grass which comes in a variety of colour and lengths. Ring the field with a coarse turf flock and you have a variety of fields. Further investigation into the medieval landscape I found this tidbit on the partitioning of land. The illustration is taken from Wikipedia, Open Field System, which oddly enough demonstrates most of the terrain options listed in DBA 3.0 for Arable. 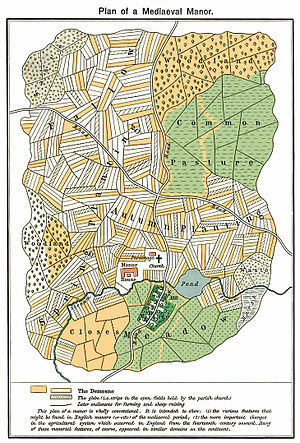 A Manor, Hamlet, edifices (parsonage), enclosures, ploughland, forests, open fields (common land), a stream and pond. This layout is ready for a big battle game. Excellent. I like this a lot. The idea could be extended to a long campiagn, one that covers several years...and if the same area was fought over twice but in different years ..it would, due to the crop rotation system be completely different. Not to forget the continuous failure of crops leading a freeman's economic demise to indentured servitude or slavery, these make good event cards. I would however, see the economic scale slide up and down in a natural way. As the "meter" moves downward, this would certainly animate the nobles to drastic solutions - war. As it moves upward, then the upper crust look to make further profits by lending or subsidizing others to do same. My next article will cover Finance. I found this particularly interesting.